My Christmas candles were completely depleted this year, but I could not throw out the nifty glass jars with lids that they came in. I removed the remaining small amount of wax at the bottom by boiling some water and then holding the jar base in it for a few seconds until the wax loosened, then just removed it and cleaned the jar. They were ready to begin their next life as etched projects! 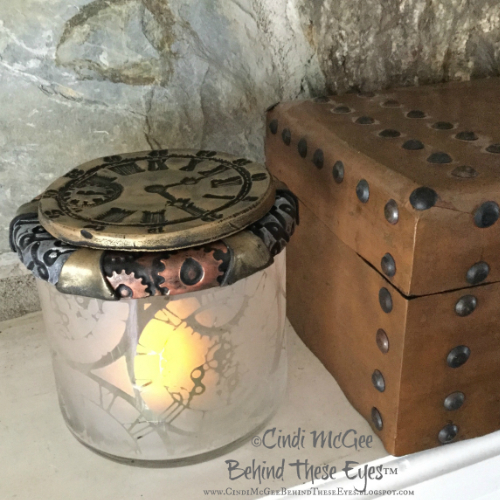 I used the first jar to create this steampunk themed votive candle holder or treasure jar – it works perfectly for either use! In a well ventilated area, hold can about 8-10 inches from stencil and spray one side of stencil with an even coat of spray. Let dry until tacky. 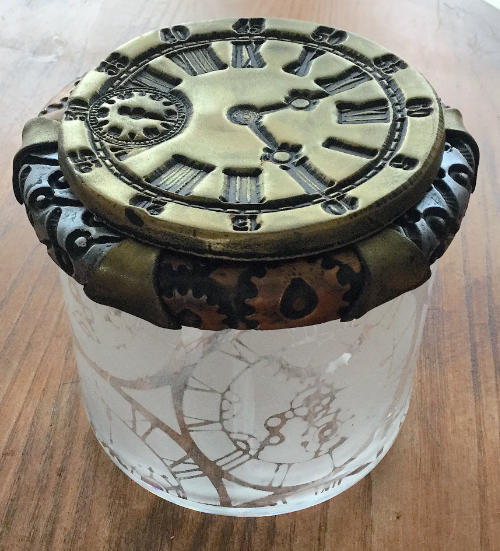 Wrap stencil around jar and press in place. Use squeegee to apply a thick coat of etchall creme over stencil. Let set 15 minutes. 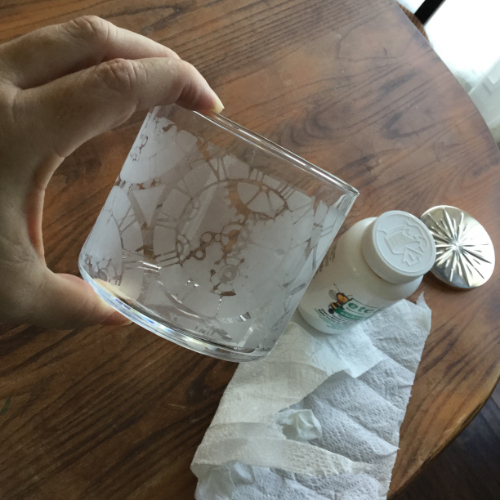 Use squeegee to return creme to jar for later use. Wash jar to remove any remaining creme and remove stencil. Let dry. Roll black Makin’s Clay to about 1/4” thick. 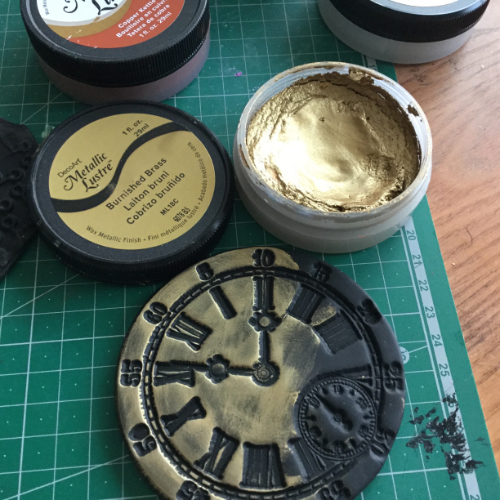 Use large clock face stamp to impress clock image into fresh clay. Use round clay cutter same size as clock face to cut out clock (or hand cut with a craft knife). Apply Burnished Brass Metallic Lustre to clock face and sides of clock. Roll remaining black clay to about 1/8″ thick. 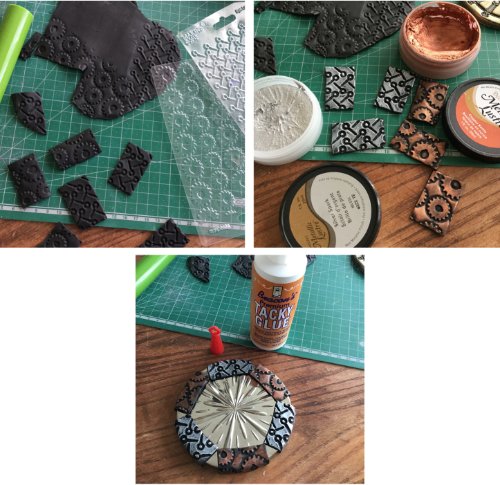 Use gears and screws texture sheets to transfer textures to rolled clay. Cut out rectangular pieces – 3 of each pattern – the size required to span the circumference of the cover as shown. Apply Copper Kettle Metallic Lustre to 3 pieces and Silver Spark Metallic Lustre to the other 3. Use tacky glue to mount the rectangular pieces around the edge of the lid, overlapping onto the top as shown. Cut triangular pieces of clay to fit between the rectangular pieces. Apply Burnished Brass Metallic Lustre and mount between rectangles. 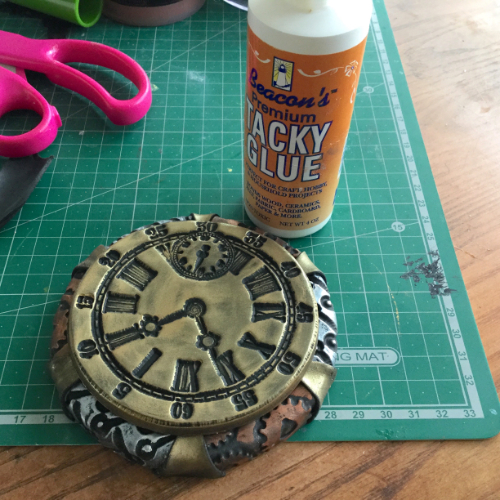 Use tacky glue to mount clock face to center of top of lid. Let dry 24 hours. Love this. Very cute and you know I’m not a big steampunk fan. Sure wish you were having classes somewhere. I look at my bottle chime every day. ? Haven’t been to UA Rec Center since u left. The stuff they make is junk. You know i love this one!!! !